You can’t beat the classics. 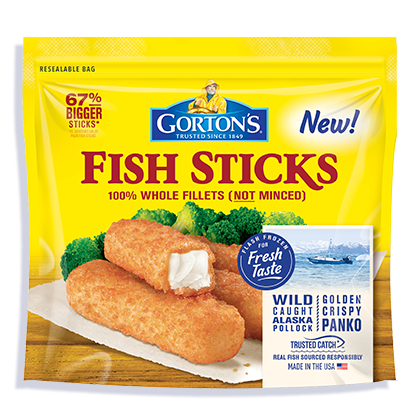 Crunchy Breaded Fish Sticks are perfectly crispy, making them the perfect intro for seafood-reluctant family members. Plus, they can be ready in just 2 minutes! 3. Bake 15-17 minutes total* Flip after 10 minutes. For extra crunch or cooking more than 8 fish sticks, add 3 minutes to the cooking time. For more than 8 sticks, conventional oven directions are recommended. 1. Arrange fish sticks in a single layer on a microwavable plate lined with parchment paper (DO NOT use wax paper). 2. Microwave on HIGH according to the chart below. 3. CAUTION: FOOD AND PLATE WILL BE HOT! Let cool in microwave before serving. **Note: For lower wattage microwaves, microwave an additional 1:30 minutes. Wheat flour, water, yellow corn flour, sugar, salt, onion powder, whey, yeast, baking powder (baking soda, sodium aluminum phosphate, cream of tartar), natural flavor.